No matter what kind of team you lead, this training experience provides the blueprint for maximizing your team’s performance. 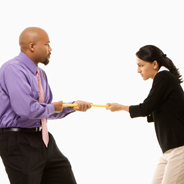 Learn how to motivate, build trust, and resolve team conflicts. In this high energy one-day training, you will obtain practical ideas and insights on what you must do in the first 90 days of leading a team. Also, you’ll discover how successful team leaders set expectations, get team members to take ownership of tasks, and maintain team morale and motivation in the face of setbacks. Develop Self-Starters & Team Members with an Ownership Mentality & More!